The summer heat in the San Francisco Bay Area can take quite a toll on the exteriors of houses in Palo Alto, which is why homeowners usually choose to reinforce their roofs. For many, this means investing in efficient roof replacement for Palo Alto homes; however, what some aren’t aware of is that they don’t necessarily have to tear off already-existing shingles to install a new one. 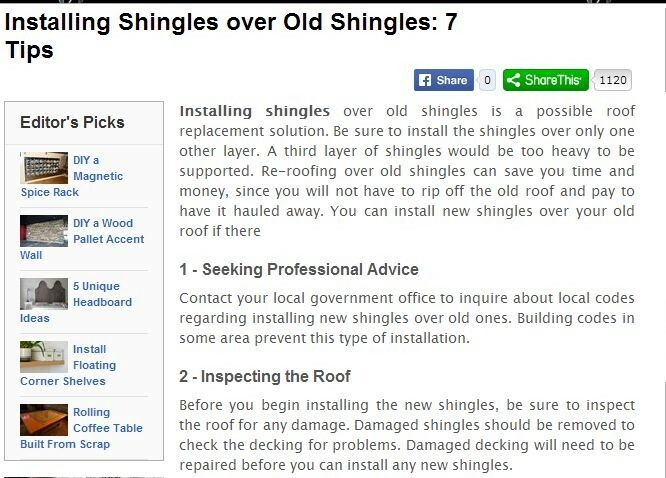 Given the right situation, residents could install a new one right on top of their old shingles. One of the first things you can do is to consult with professionals like Shelton Roofing and have your home exterior inspected. Even if they give you the green light, though, you will still need to consult your local building code since there might be restrictions in your laws against adding layers to your roof. If the regulations permit it, you can move on to the next step. Before you can begin the installation, have your roof checked for damaged or missing shingles, since each of these could significantly degrade the efficiency of your re-roofing. Another reason to remove damaged shingles is to allow you to check the decking below for potential problems that require intervention before you can move on. “Install a layer of roofing felt over the roof before you begin installing the new shingles. The felt should be secured every 6 inches with nails or staples. The layers of felt should be overlapped by 1 inch as you work toward the roof ridge. This will help keep any moisture from getting under the felt. Most of the time, a reroof can be completed even without having to replace any of the flashing. Nevertheless, you can always take this opportunity to install more efficient flashing, such as the drip-edge type, for a further reinforced roof structure. Ask Palo Alto, CA roofing contractors whether this would be a practical move for you. While a reroofing job is generally more cost-efficient than a tear-off replacement, inspecting your old shingles before placing new ones over them is still necessary. After all, you wouldn’t want your roof destroyed from the inside, would you?